The computer giant's current woes have been overhyped. But it still needs to figure out how to build a brand that customers can love. (FORTUNE Magazine) -- August was the cruelest month for the computer company Michael Dell founded in his University of Texas dorm room 22 years ago. In close succession, Dell Inc. recalled 4.1 million laptop batteries because of fears they might ignite, announced a shockingly bad quarter - profits down 51% from a year earlier - and disclosed that the SEC has launched an informal investigation of its accounting. The company's stock, already down 25% for the year, fell further. A few pundits called for the firing of Kevin Rollins, Michael Dell's longtime right-hand man and handpicked successor as CEO. ("Kevin 'Exploding Battery' Rollins," Jim Cramer called him on CNBC, then cued a recording of boos.) A front-page headline in the Wall Street Journal trumpeted that Dell was being "left behind." 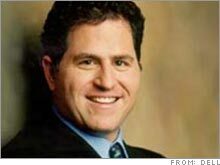 'Dell is in the penalty box' admits founder Michael Dell. Dell shares (blue) have skidded 39 percent, while HP's stock (yellow) has surged 32 percent in the last year.  What about Apple and Google? The company has been in the news, but for all the wrong reasons. Below is a timeline of the latest events to befall the PC maker. 8/14 Recalls 4.1 million batteries with cells manufactured by Sony, saying the batteries could overheat and cause a risk of fire. 8/17 Reports second-quarter net income of $502 million, a 51 percent decline from the same period a year ago. 8/18 Analysts at Goldman Sachs and UBS downgrade the stock. This rhetoric is overblown. More is going right at Dell (Charts) than most of the media coverage would lead you to suspect. The company's recent run of bad news appears to be a lagging indicator, much of it the result of past moves that Michael Dell himself variously describes as "stupid," "nonsense," and "just plain wrong" - and many of which, he says, have been corrected. The SEC inquiry, about which Dell has disclosed little, is a wildcard but not an unusual one in modern corporate America. Meanwhile Dell remains the dominant PC maker, especially in the U.S. Key rivals Hewlett-Packard (Charts) and Lenovo (the Chinese company that bought IBM's PC business) have improved their games, but only HP, with 16% worldwide market share (according to International Data Corp.), is in the same league with Dell, which has 19%. Dell does - make no mistake about it - face some real and serious long-term challenges. Most obviously, the company will never replicate the stunning growth surge it experienced in the 1990s - its sales soared from $546 million in fiscal 1991 to $32 billion in 2001. With revenue of $56 billion, No. 25 on this year's FORTUNE 500, Dell is now simply too large for that. An even bigger issue is that the low-cost, low-style approach that shot Dell to the top seems out of place in today's computer market. Branding matters. Product design too. Those haven't been Dell's strengths. As one marketer from outside the computer business told me, Dell's brand consists of "a man and a business model." "If you ask, 'Okay, is Dell in the penalty box?' Yeah, Dell's in the penalty box," is how Michael Dell puts it. "Then we'll use this opportunity to fix everything." In 15 years of conversations with Michael Dell, I've never heard him more contrite. He recognizes that his company has to operate differently, especially in how it relates to its customers both before and after they buy a computer. But he also sounds excited by the challenge of getting it back on track: "This cathartic experience has caused us to say, 'Okay, what could we be doing dramatically better, dramatically different, in dramatically new ways?'" Big changes started about nine months ago, and their pace is picking up. Before talking about what Dell is fixing, though, let's go back to the quarter where things went so wrong. Michael Dell and Rollins say the company attempted to boost market share by cutting prices, and it cut them too much. As a result, while it sold 6% more PCs, its operating profit declined 48%. In Europe profits dropped 90%. The problem, Rollins says, was entirely in PCs sold to businesses, which did not increase purchases as Dell expected when it lowered prices. Rollins portrays it as a one-time pricing and purchasing miscalculation. (We will, of course, see about that.) Dell was also slower than its competitors to embrace the cheaper and in some cases better chips of Intel (Charts) competitor AMD (Charts). That's now changing, and fast. It's revealing, though, that despite the shock over last quarter's profits, most of the work now going on inside the company is aimed at remaking Dell's strained relationship with its customers - and by extension, its brand. "We had this historical structural advantage which manifested itself in lower price and better value for customers," Michael Dell says, "and I think we overemphasized the price element and did not emphasize relationship and customization and experience." The company also certainly didn't emphasize design. While just about everyone continues to admire Dell's logistical efficiency, its business model - selling direct to the customer instead of through retailers and resellers - no longer sets it apart as it once did. Those that couldn't match its low costs have gone away, and now HP and Lenovo have arisen as Dell's primary worldwide adversaries. Both are now themselves stunningly efficient. And even when Dell is able to offer customers more computing power for their money, it matters less. How fast a processor do you need to surf the Internet, anyway? What seems to worry Dell and Rollins most is unhappy customers. While the company long had a reputation as the one PC maker that would never let customers suffer a broken machine for long, after-sale service at Dell degraded abysmally in the past couple of years. Dell shifted a large portion of its call centers to India, the Philippines, and elsewhere, and began using scads of temporary workers. "They put a knife in their own heart," Nick Donatiello, CEO of Odyssey, a San Francisco consulting firm, told me. In the much-watched annual University of Michigan American Customer Satisfaction Index, Dell's score dropped sharply in 2005, landing for the first time at only the industry average. The company's internal "likely-to-repurchase" scores showed a decline that was equally disturbing. "The team was managing cost instead of managing service and quality," Michael Dell confesses. Managers were evaluating call-center employees primarily on how long they stayed on each customer call. That guaranteed customers would be unhappy and, with their problems unresolved, would call again, angrier still. This year the centers started measuring how well the problem is solved the first time. It also used to be that if a customer called with a Microsoft Office problem, they were told to call Microsoft. No more. The company has hired "thousands" of people - "most of them in North America," Michael Dell pointedly adds. It has dramatically reduced the use of temporary employees. It is eliminating most coupons, promotions, and rebates, settling instead on an everyday-low-price model. It is creating innovative software to keep customers' machines purring. And if you buy online today, don't be surprised if tomorrow a friendly Dell voice calls asking if you are satisfied. The renovations, which the company says will cost $150 million, seem to be having a big impact. Dell says it got two million fewer customer-support calls in the past quarter than it had expected. The average time customers spent on hold dropped by half. Within weeks after the company started instituting the changes, internal measures of customer satisfaction went up - "dramatically, like seven or eight points," Michael Dell says. Likely-to-repurchase figures are now back to pre-2005 levels. And in the just-announced 2006 University of Michigan survey, Dell's score rose significantly. Now it is second only to Apple (Charts) and several points above archrival HP. But while Dell may be on its way toward fixing the customer-service side of the branding equation, its actual products still leave much to be desired. The PC industry is changing, and up to now Dell hasn't sufficiently changed with it. Apple's extraordinary product successes - the iMac, the MacBook models, and most of all the twin home runs of the iPod and the iTunes Music Store - have exposed an imagination gap in an industry long structured around slapping together Intel processors and Microsoft operating systems in an essentially generic box. Rival HP is fast changing how it defines its products. Its latest - the MediaSmart TV - can function as a conventional TV or as a wireless monitor for a PC, from which it can stream videos or music and display photos. The company's ads are suddenly hugely appealing. One shows only the hands of rapper and businessman Jay-Z conjuring animated representations of the cool things on his HP laptop. The focus is not on the product but rather the feelings it enables and the way it changes your life. Dell, by contrast, remains the ultimate provider of white-bread (well, gray plastic) PCs. It still mostly markets them as if they were alike, distinguished only by minor component, power, and price variations. Says PC industry marketing expert Aaron Goldberg of Ziff-Davis: "Competitors are selling the use, the solution. But Dell's still selling products - the BQS31-S273." In a maturing, consolidating industry, which this unquestionably is, the most profits typically come from selling premium products, not basic ones. Dell's machines risk being superseded by competitors with more style, just as was Ford's Model T - another revolutionary manufacturing and cost breakthrough. A recent brand audit Dell conducted found consumers using unenthusiastic words like "faceless" to describe it. The company especially pales next to Apple, whose products are increasingly seen as the de facto tools for creation and entertainment. "Dell is down there with food and shelter in the hierarchy of human needs," says Chris Meyer, a longtime tech industry strategy consultant with the Monitor Group. Dell is trying to move toward less generic products. Last year the company launched a high-end sub-brand called XPS and bought gaming-PC-maker Alienware, which targets computing speed freaks. One XPS tower PC for gamers comes in bright red, canted forward like a racecar, with lights in the back so it's easy to manage all the wiring. Dell himself proudly cites the XPS M2010, a unique "luggable" multimedia computer designed to be carried from room to room - complete with a large screen, high-quality speakers, and an easy-to-access DVD player. But some experts are unimpressed. Donald Norman, a renowned product designer, wrote of the M2010 in a recent tech newsletter, "The design is a good match to the name: sensible, logical, ugly." Another necessary move, and one that Dell and Rollins admit took too long, was putting microprocessors from AMD in the company's products. For about two years AMD has built processors that are faster and/or more energy-efficient than Intel's in several categories. AMD's list prices were lower too, but until May, Dell alone among major PC makers refused to sell them. Now Michael Dell says with emphasis, "We overestimated Intel and underestimated AMD in prior periods." He suggests that Dell's use of AMD chips will go much further than the two types of servers and one desktop line it has already announced. Dell, he says, is an "equal-opportunity processor user." For all its missteps, Dell's position in the market remains strong. In July, the Investor's Business Daily/TIPP Home Computer Purchase survey found that a stunning 50% of people in the U.S. who are planning to buy a PC said they would buy Dell. It sells more computers here than the next three players - HP, Gateway, and Apple - combined, and its market share among large businesses is 45%. But that domestic PC dominance is hard to improve upon dramatically, which has led Dell to look elsewhere for growth. A few years back, makers of everything from servers to printers to TVs feared that Dell would ride its uniquely efficient business model to dominance in their industries. Things haven't quite worked out that way - not yet, at least. But the company has had success in selling PC-related products and services to businesses. Its half-billion dollars in storage sales in the quarter ended Aug. 4 represented 36% growth from a year earlier. Services, at $1.4 billion, rose a respectable 21%. So can Dell grow enough to make investors cheer again? When Michael Dell says that "we absolutely do aspire to be a growth company," he's thinking mostly about markets outside the U.S. He points to China - 31% revenue growth last quarter. Dell sells three times as many servers based on PC-style chips there as does local hero Lenovo. Dell is No. 1 in desktop computers in Japan. Dell's overall PC market share is 33% in the U.S. but only about 12.5% in the rest of the world, presenting a big opportunity for growth. As more people worldwide connect to the Internet, there's no reason Dell's direct-sales model can't succeed in newer markets. Says Tim Bajarin, a longtime PC industry expert at consulting firm Creative Strategies: "I talk to Dell's competitors, and they're concerned that when it does actually come back it will be even more tenacious." Tenacious is a good word to describe Michael Dell and the company he created. And tenacity and efficiency will be enough to keep Dell in the game. But to rise to the next level and really boost its growth, it may have to find a little more heart. Marc Gunther contributed to this article.